Deliverable 4.1 tackles an important aspect of the technology development in the project which is ensuring an up-to-date understanding of the various cybersecurity concerns and existing solutions and identifying gaps and improvements. Cybersecurity is a challenging research and development area that needs to continuously evolve to keep pace with emerging threats and vulnerabilities. The activities leading to the deliverable have contributed considerably to identifying the appropriate technologies and standards and ruling out the less useful ones. Some standards have been evaluated in D5.2 (e.g. ZigBee [‎2], FIPA-ACL [‎2‎3], OpenADR [‎4]) for their relevance and suitability to Mas2tering. D4.1 revisits those standards to evaluate their security and their need for adding security standards and technologies to protect their implementation. Some standards (e.g. FIPA-ACL) have no built-in security while others do have limited security features (e.g. ZigBee). OpenADR has strong built-in security but lacks some considerations of consumer privacy. D4.1 details the evaluation of security standards that are potentially useful for protecting the Mas2tering platform. Several security standards (e.g. ISO/IEC 2700 series [‎5], IPSec, NIST 7628 [‎6]) are evaluated based on multiple important aspects including their applicability and relevance to Mas2tering use cases. These evaluations include descriptions of recommendations regarding their use in the project. EBIOS [‎7] risk assessment method used for Mas2tering use cases (see ‎Annex A) is compatible with IEEE 27001. Other security standards are or will be used in the project include TLS (Transport Layer Security), IPSec, XACML as well as standard algorithms such as AES (Advanced Encryption Standard). In order to ensure a secure implementation of the Mas2tering platform, this document also includes security analysis of the software technologies that will be used in the project. These include JADE [‎8] (Java Agent Development) framework, JEMMA [‎9] (Java Energy Management Application) framework and FIWARE [‎10] Generic Enablers. Their security features and weaknesses are outlined. Due to the security limitations of JADE, a security add-on called JADE-S is available which provides several features such as message authentication and encryption. JEMMA also has security shortcomings such as the lack of authentication and access control. Regarding Generic Enablers, it has been found that they often lack rigorous security testing and may not be reliable especially as security components. Therefore, the project identified alternative more reliable software components. The deliverable includes guidelines and recommendations on security technologies and standards, and on security testing and verification of Mas2tering platform components. The recommendations aim to address security requirements and overcome the security weaknesses in the used standards and technologies. These recommendations include which standards should be used and what security configurations are needed such as those in relation to certificates and key sizes. The recommended security testing and verification activities are based on the use cases identifying specific security objectives and taking into consideration the identified security vulnerabilities from the risk assessment. The annex contains the security and privacy requirements of the project based on the assessment of the attack scenarios and the potential vulnerabilities in the project’s three use cases. The requirements and the assessment are originally included as part of D2.1. The security and privacy requirements elicited from the risk assessment of the use cases have significantly complemented the initial security requirements specified in D2.1 leading to better understanding of the risks and broader focus on the appropriate security and privacy solutions. The scenarios and requirements are added to the annex for referencing purposes. 2 Cybersecurity and Smart Grid Standards. This chapter describes security capabilities of existing technologies that are particularly relevant to Mas2tering. It also analyses related EU projects including the adequacy of their implemented solutions for use in Mas2tering. This section presents the analysis of the security and privacy of a number of technologies that have been selected to be used in the Mas2tering platform. These technologies include JADE platform and its extensions, relevant HAN technologies including JEMMA and FIWARE Generic Enablers. JADE (Java Agent Development) is a popular MAS platform. It has been selected in order to provide the basis, on top of which the Multi-agent system for Mas2tering solution will be built. As such, it will play a central role in Mas2tering, and this is why we study it from a security point on view in this section. We first review the architecture of JADE and then describe how Security is tackled in JADE. JADE is a distributed agent platform, which is composed of several Jade Agent Containers, running on different physical hosts. Each agent container may contain any number of agents, whereas there is only one main container, which contains special agents providing services that are unique to the platform: the AMS (Agent Management System) and the DF (Directory Facilitator). 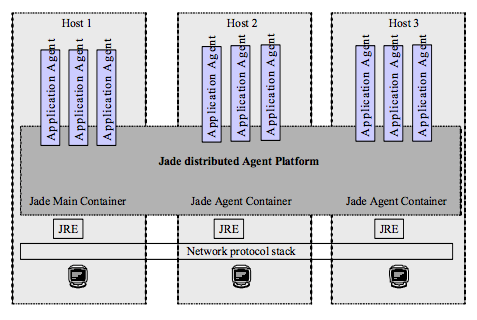 Figure 1 shows an example of a JADE platform that is distributed over several physical hosts. Agents are Java threads with communication capabilities, provided by the platform allowing them to communicate with any other agent transparently of the physical location. Services in JADE are either provided as kernel services, which can be easily extended by add-ons, or can be provided by dedicated agents, as it is the case with AMS and DF. The communication mechanism between agents is implemented differently depending on their respective physical location. If the agents are hosted in the same container, Java events are used; if the agents are located on the same hosts but in different container, RMI is used; if the agents are located on different platform instances, MTS (Message Transfer Service) is utilised. Messages are handled either by an IMTP (Internal Message Transfer Protocol) or by MTP (Message Transport Protocol) in the case messages are transmitted between distant hosts. MTP encodes the FIPA-ACL messages with which the agents communicate over transport layers. Jade already counts on implemented transfer protocols, namely: CORBA IIOP and HTTP, which are used by default. It is possible to use further protocols by adding plugins and configuring JADE to use them. Messages are not authenticated: it is possible to forge messages and insert them in the current conversations between agents to induce the agents in an erroneous state. Messages are not encrypted: it is straightforward to eavesdrop on the traffic and extract private information from the agents. Agents are not authenticated: any agent can join a platform, even malicious ones, which may acquire private information or attack the system. Access rights of agents are not controlled: any agent can communicate with any other agent and call any service. While this platform is a core part of the Mas2tering implementation, further effort is required for providing high security to the system. Due to the previous limitations of the basic JADE platform, an add-on was developed to tackle all the above mentioned issues. This add-on is called JADE-S, and it focuses on protecting JADE-based multi agent systems against security attacks. In the following, we describe JADE-S analysing its features and its limitations. JADE-S, which is the combination of JADE and the JADE security add-on, is the most prominent security extension of JADE, which was developed by Telecom Italia. JADE-S is publicly distributed on JADE’s website and has been studied, used, and tested extensively. Figure 2 shows the architecture of JADE-S. Agent authentication is based on JAAS (Java Authentication and Authorization Service). It is used to authenticate agents, and can be connected to a number of login modules. A login module checks login and password following an authentication protocol. All the agents and containers must be authenticated. Each time a user wants to attach a container to the platform, it has to authenticate it by providing a password. All the agents inside an authenticated container are authenticated. The login modules supported by JADE-S are Unix, Windows NT, Kerberos and plaintext password files. However, JAAS is designed to use plugins and as such new login modules can be written, for instance for LDAP authentication. The permission service enforces on users a set of rules defined in an ACL (Access Control List). The organisation of the rules revolves around the concept of principals, roles and resources. A principal is an entity that can take action and be held accountable. Users, containers, agents and external entities are principals. Roles are groups where principals can be added or removed, and to which permission on resources are attached. Permissions can be delegated. The ACL is stored in a file, which uses JAAS syntax. All actions that agents can perform in the platform, except for mobility, can be permitted or denied, and are by default denied [‎21]. Such actions are the default Java access to resources and JADE-S specific rights to create/destroy principals (except users) and to send/receive messages. There is a global policy file in the main container, applying globally, and there can be other policy files local for each container, applying locally. Communications restrictions are limited as they do not restrict the usage of services provided by the agents. Finer control can be obtained by coding intermediary agents enforcing additional access control. Message signature enforces message integrity and non-repudiation. In JADE-S, each agent owns a public and a private key pair by means of which it can sign in and encrypt messages. The verification of the message’s integrity is done automatically, whereas non-authenticated messages produce a failure message. Message signing and verification is done with the JCE (Java Cryptographic Extension). The main container serves the role of a CA (Certification Authority), thereby guaranteeing the authenticity of all the agents present in the MAS. Encryption provides message confidentiality. It is done in JADE-S by encrypting all the FIPA-ACL messages the agent exchange with SSL using the JSSE (Java Secure Socket Extension). In JADE-S, only agent messages are encrypted, whereas messages used by the platform for its management are transmitted without encryption. Among such information sent in clear text are the passwords used by the JADE-S security service, which is a very serious security issue. In order to mitigate this issue it is necessary to put in place SSL connections for the IMTP. Such a secure connection is however available in JADE-S and it is implemented using mutually authenticated SSL connections between containers. Such an approach requires each container to have a certificate of its own and to possess the certificate of all the other containers it needs to communicate with, which can cause a scalability issue. Another consequence is that it requires each user to possess a certificate, which can be problematic for some users. The message permissions are quite generic and limited since they only provide the possibility to determine the permission to send and receive messages to/from owners or agents. Although it provides user/agent based permissions, it is not possible to determine own user specific permissions. The encryption service cannot guarantee a secure channel for authentication and platform managing commands. The documentation on JADE-S is still poor. 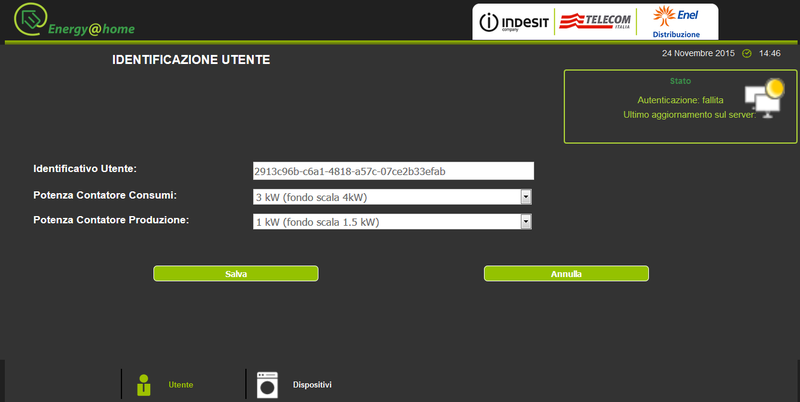 JEMMA (Java-based Energy ManageMent Application) is an open-source LGPL modular framework that facilitates the development of home energy management (monitoring and control) applications [‎18] It has been developed by Telecom Italia, one founding member of the non-profit Energy@home Association [‎19]. Current release is version 0.9. 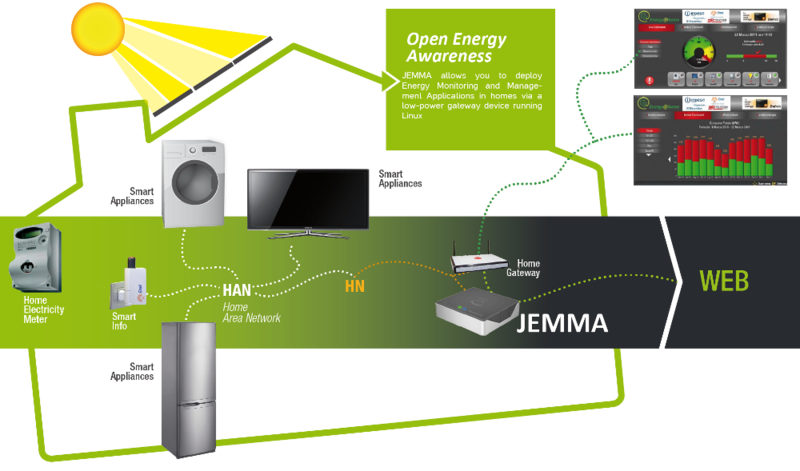 The Energy Management System can be executed on a Home Gateway that is able to collect energy data (metering information) from the Home Area Network (HAN), and publish them in the Home Network (HN) and the Wide Area Network (WAN). 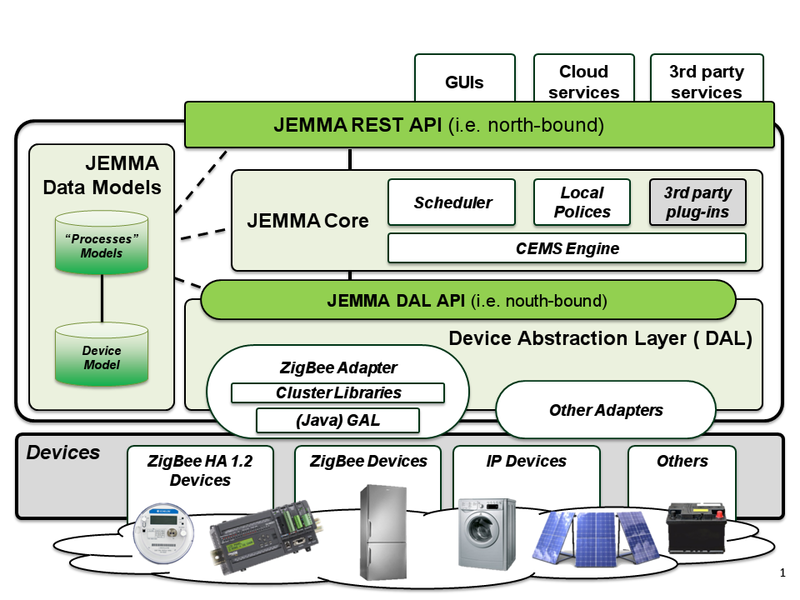 JEMMA supports the ZigBee Home Automation 1.2 and the ZigBee Gateway Device standards. JEMMA offers open APIs for GUIs, cloud services and third party services, and device abstraction layer APIs for connecting hardware devices as shown in the next figure. The Apache Felix Web Console, as shown below, allows starting, updating or deleting OSGi bundles. The default configuration of the JEMMA framework provides a HTTP access to the web portals depicted above, while one could expect to get a HTTPS connection instead. The configuration file config.ini allows activating easily the HTTPS protocol, though. However, it can be also observed that this configuration file contains a plain text password for accessing to Apache Felix OSGi Web Console, which is clearly not compliant with the state of the art! In addition, it seems that this configuration file is not protected against any alteration, and anyone with a write access profile could modify the parameters. It is then important to offer the right level of protection to this file. Encryption: JEMMA framework supports the HTTPS protocol. However, it is unknown if it is possible to configure the cipher suites. Message signature: HTTP GET and POST requests are not signed. It is possible to forge fake messages. Authentication & access control: No authentication is available. Any device can retrieve, through a HTTP GET request, a list of all available devices, including the device unique ID, which can be used to directly access to the device. Similarly, a HTTP GET request can be used to retrieve the list of the available functions supported by a device. Access rights: A mere HTTP POST request can be used to invoke a remote operation on a function. Prior successful authentication or access control is not required. – Assurance regarding the reliability and robustness of the security functions requires intensive testing and wide user community and feedback regarding potential vulnerabilities. Based on the experience of TSSG in using the GEs the current versions lack satisfactory security assurance from the aspects described and often subject to runtime errors. – The instability of the FIWARE catalogue such as the removal of GEs and consequent loss of developer support, access to updates, etc. This also affects the reliance on the continuity of the security services provided by the GEs. Since the start of Mas2tering project Content Based Security GE has been removed and the Security Monitoring GE is deprecated. – In addition, in the context of another EU project Finesce , TSSG carried out comparison of the current quality of the GEs to alternative commercial and open source software based on a set of criteria such as performance, compatibility, usability, reliability and maintainability. The results of the comparison show that alternatives are often scoring higher possibly due to their level of maturity compared to the more recently developed GEs. – Dependency of some of the security GEs on other GEs can further complicate their usage in Mas2tering platform and expose the platform to more cascading errors. – Some of the GEs are only available as an online service which makes it impossible or difficult to evaluate their security and becomes more reliant on trust in the competence and integrity of their service providers. Despite the drawbacks described above, there seems to be active development going on to improve the GEs and progress their technology readiness level. Mas2tering project has identified alternative components that provide more reliable and stable functions. Such components include PANDA (access control to the HAN), ARX anonymization, JADE framework, cloud synchronization and forecasting service. These components are detailed in other deliverables such as D5.3. – SEGRID – Security for Smart Electricity GRIDs. The listed projects have been selected based on their relevancy to cyber security technologies applied to the energy network. They have been then analysed in terms of general objectives, cyber security objectives, components and services developed, demonstration activities and relevance to the Mas2tering project. General scope of the project Focusing on medium and low voltage power distribution network, SPARKS aims to secure network connected and remotely controlled equipment, such as substation monitoring and control systems, Distributed energy Resources and flexible loads included in Demand Response programs. Moreover a focus on micro grids security aims to ensure a decentralized resilient power supply in the event of grid-disconnection. – Providing a summary and a rationalization of security reference architectures proposed by standard bodies and commercial offering from organizations for the detection and analysis of cyber-attacks, and other threads like mis-configurations, to smart grid and provision of control strategies aiming to ensure resilience of the grid. – Intrusions to SCADA ICS including devices that use both standards protocols, like IEC 61850, and Manufacturer Message Specific – MMS – devices, targeting specific vulnerabilities of such hybrid systems. Cyber-attacks and mis-configurations directed to Automatic Metering Infrastructures – AMIs. – Side channel attacks directed to Advanced Metering Infrastructures – AMIs – by investigating the use of hardware implemented Physical Unclonable Functions – PFUs – on smart meters and gateways in order to provide authentication protocols generating cryptographic key to protect confidentiality of metered data exchanged. Commercial services SPARKS Stakeholder Workshops: Series of workshops where members of the stakeholders group are invited in order to raise their awareness of smart grid cyber security issues as well as supporting industry members in the development of world-leading protective measures. Members receive privileged access to projects results and can provide requirements and feedbacks related to project activities. Scope Evaluation and Demonstration of the scientific and technological outcomes of the project in realistic scenarios (ongoing). Smart grid test bed facilities include the AIT SmartEST Lab, the NIMBUS micro grid and the large-scale distribution network provided by partner SWW Wunsiedel. Adequacy SPARKS is particularly adequate to Mas2tering since it targets cyber security issues in the MV and LV grids. The software and methodologies developed in SPARKS could be considered for the elicitation of the Mas2tering cyber security requirements. Comments Members of the SPARK project should be included in the Mas2tering Value Driven Advisory Group. General scope of the project To develop a Decision Support System (DSS) for the protection of the European energy system against malicious and accidental/natural attacks. Attacks are both physical (directed to components) and cyber (directed to monitoring systems, control and communication architecture, and so on). The brief scope is to keep the electricity supply safe. In order to do this SESAME develops a prototype software package and a comprehensive regulatory framework for the security of electricity system in Europe. Cyber security objectives The following objectives related to cyber security are targeted. – Detect repetitive and long-term erroneous trends in the security of energy supply. Targeted security threats Cyber security attacks include attacks directed towards monitoring systems, control and communication architecture. Adequacy Partially adequate to Mas2tering, since it mainly targets the transmission grid (TSO) and the generation plants. General scope of the project AFTER targets the issues related to vulnerability evaluation and contingency planning of the energy grids and generation plants. In particular AFTER aims at enhancing the TSO’s capabilities in creating, monitoring and managing secure interconnected electrical power system infrastructures. – Develop concepts and techniques for physical and cyber security (including sensing, monitoring and software agent technologies for security, monitoring and early warning). Software – Global risk assessment tool (available online). This is able to elaborate probabilistic models for threats, component vulnerabilities and failures for TSOs. – Physical security support tool, devoted to detect and provide early warning of physical intrusion into energy system facilities including power plants and substation. The system is based on advanced algorithms to manage cameras. Adequacy Only partially adequate to Mas2tering. AFTER targets more physical than cyber security issues and also targets TSOs and transmission system. However some of the methodologies developed for risk assessments and early warning systems could be used and adapted to the scope of Mas2tering. General scope of the project SCISSOR’s general scope deals with the design of a new generation SCADA security monitoring framework, as those systems have been recognised as the weakest components of smart grids. – Control and coordination of probes and sensors enforcing cryptographic protection by means of certificate-less identity/attribute-based encryption scheme. Targeted security threats Cyber-attacks to SCADA systems based on commercial common low cost equipment such as Windows and Linux based industrial PCs or servers, commercial switches and embedded systems, and relying on the same Standard Internet Protocols ( TCP/IP, HTTP, FTP, UDP, etc.). Software SCISSOR HMI, a user friendly human machine interface presenting to the human end user a real time view of SCADA system behaviour. Comments To be evaluated again once the initial results of SCISSOR will be available. General scope of the project The main scope of SEGRID is the enhancement of smart grids protection against cyber-attacks. In order to do this SEGRID uses a risk management approach and a number of uses cases, these allowing definition of requirement for security, gaps identification for current technologies used for smart grid security and related standards and regulation frameworks. Novel security measures for smart grids will be developed and tested as main output of the project. – Evaluation and improvement of currently available risk management methodologies in order to make them capable to identify and assess the risk factors that will be keys to the future smart grids of 2020 using a “gradually evolving system” approach. 5) Automatic reconfiguration of the power grid. – Privacy-by-design toolbox, including new privacy design patterns and homomorphic encryption techniques aiming to collect less personal sensitive data without affecting the required functionalities. Adequacy Very adequate to Mas2tering, since it targets tools and methodologies similar to those required in Mas2tering. In particular, aspects like privacy by design and encryption are in common. Cybersecurity is a fast evolving area of research and development that aims to keep pace with advancing cybercrimes, intrusions, and various forms of cyber-attacks. Advancing cybersecurity for the smart grid is of particular importance in order to assure the success of rolling out of its technologies and protect the critical electricity infrastructure. A distributed multi-agent-based platform is developed in the scope of Mas2tering project, the detailed understanding of the available cybersecurity standards and technologies, and identification the gaps between existing standards and required standards are vital for the success of the project. The authors of the deliverable perform a security and privacy assessment of the three selected project use cases. The assessment helps identify areas of vulnerabilities and weaknesses that need to be addressed in the project. We then evaluate the state of the art of the security standards and technologies that are relevant to the project. In addition, we evaluate other relevant smart grid and telecommunication standards that are not security-focused from a security point of view. Based on this evaluation, we provide recommendations for improvements and justifications of choices made in the project.